Marriage (1): Janet Christina ARMSTRONG  on 6 Oct 1880 in St Pauls Nth Rockhampton Qld. Stanford with his brothers sailed 12 April 1869 steerage on the "Young Australia" and arrived in Brisbane 13th July 1869. He was aged 15 and a free settler, remaining in Queensland all his life. At the time of his marriage he was a stockman at Corio. Australian Electoral Rolls 1903 Queensland Capricornia Tarabonah. Percy was recorded as station master of Stoney Creek, Nankin Junction. When his first wife Christina died he was left with six small children so he advertised for a wife and sailed to England to seek a suitable one out. His choice could not have been better in Mary Evans. He entered the service of the Queensland Railways retiring about 1922 having been Station Master at Nankin Junction, Stanwell and other stations in the Rockhampton area. His brother Alfred was Vicar in Rockhampton and baptised four of his children Ida, Gwendoline, Ronald & Stanley. 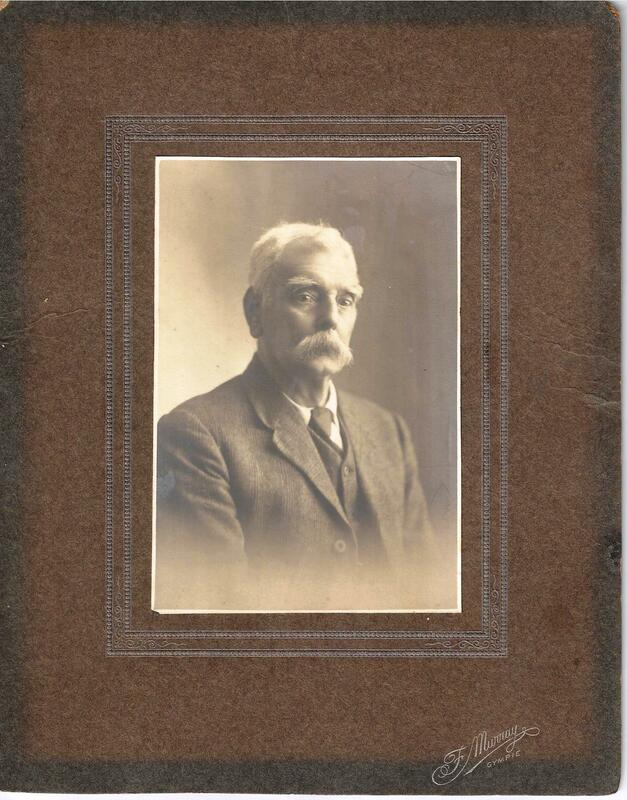 It appears that about 1910 he moved to Curra, near Gympie as Station-master and remained there until he retired. Railway memos below indicate he was not a man to be manipulated. His younger children were schooled at Curra. He retired to an agricultural and dairy farm owned by his son-in-law Alex Wilson at Sexton, near Gympie but did not work the farm. He was over 6 ft. tall with thick snow-white hair, clean shaven and quite the best looking of the brothers. LETTER FROM PERCY'S BROTHER-IN-LAW : E.C.P. Hull. I daresay you have been thinking we have been [Clark and I] somewhat dilatory in settling up the affairs of the Executorship under your late Father's Will. These, however, are matters which occupy a good deal of time and labour, and cannot well be hurried. I am bound to say that Jack Clark, who is a first rate man of business as well as one of the kindest and best of fellows, has been doing most of the work. This has been a great relief to me, as my partner has been absent since the end of June, and I have had almost too much work on hand. To Charles at the Maryborough Branch L1,000. To Alfred at the Rockhampton Branch L1,000. These remittances are on account of the amounts which will be due to you each out of the Estate. In exchange for these payments you will each have to sign the forms on receipt which we have handed the Bank here, and these receipts when signed the Banks will send home to be delivered to us. You will, of course, understand why the L2,000 has been remitted to you, as against L1000 only to Charles and Alfred. We have also invested the L3,000 left to Blanche as her Trustees, and paid the L1,500 pounds left to Lucy for the purpose you no doubt understand about. Clark is now away for his month's holiday at the sea-side, and I shall be going away for mine towards the latter part of this month, and it will therefore probably be a month or two yet before we shall be able to get this matter finally closed. Fanny and her children have been spending four weeks by the seaside at Brighton which has done them all much good, and they have returned home in the best of health. From these school records it appears that Stanford Percy transferred to Curra end of 1909 or very early 1910. Dorothy Joyce : age 6 years 4 months commenced school at Curra 29 Jan 1913. On the first instance you inform me that 14 up 31st ult was delayed 15 or 16 minutes at your station. Your B4382 of the 6th inst re the above. I beg to inform you that as I made no statement to you I have nothing to confirm on your statement above, about the accident to 14 up I remarked that she stopped here as the driver was doing something to the engine further than that I do not know what was the cause of the delay and I think it is very hard that a casual remark made unofficially to you should be made use of again and I am sorry to say that for the future I shall have to be very careful indeed what I say before you. Delay to 14 Up 31st October. Your number 73 of 7th inst. You certainly informed me that 14 up was 15 or 16 minutes at your station on 31st ulto, and the reason then given was that the driver was doing something to his engine. You will be good enough to confirm this statement as to time at your station, or withdraw it. It is your duty as an Officer of the Commissioners to give me any information you may have in connection with the running of trains etc and I shall be glad of any further explanation you may have to offer on your memo under answered: particularly on the statement "I am sorry to have to say that for the future I shall have to be very careful indeed what I say before you". Your memo No. 73 of 8th inst. I wish to give you an opportunity of reconsidering your position in this matter. The guard in his report sheet shows only one minute at Stanwell, while you informed me verbally train was fifteen or sixteen minutes at your station. Your B4382 of the 9th inst re the above. I beg to inform you that I have nothing to reconsider in this matter my memos 72 and 73 are perfectly correct in every particular. Points lock and Choke lock Unlocked at Curra on 3 July 1911. I have this day received a copy of the above and note contents. STANFORD PERCY JULIUS : 19th September 1929. Death has claimed an old and respected resident in the person of S.P. JULIUS who died in a Private Hospital on Gympie on the 19th instant. The late Mr Julius, who had passed his seventieth year, had enjoyed good health until a few weeks prior to his death. Mr Julius had served a considerable number of years in the Queensland Railway Department in the capacity of Station Master, and was stationed at Curra for a lengthy period until the age regulation compelled his retirement a few years ago. Since then he had been engaged actively in dairying and agricultural pursuits at Sexton. He is survived by his widow and grown up family. JULIUS Stanford Percy of Sexton : At Gympie on September 19 after a short illness. In his 75th year "So He giveth his beloved sleep". Percy received a letter dated 27 October 1894, from his father regarding his brother "Arthur's most disgraceful conduct" see notes Arthur Cowper Julius. A Percy Julius aged 21 arrived in Victoria Jan 1877 aboard the Nemesis (with an Alfred Julius) from Britain. A Mr S P Julius aged 24 arrived in Victoria July 1896 aboard the Ophir from Britain. Ref PROV - Unassisted Immigration to Victoria 1852-1923. 1. Census: England, 8 Apr 1861, Church St Southery NFK. Stanford is recorded as a son aged 6 born Myland ESS.